Second language learners often produce language forms resembling those of children with Specific Language Impairment (SLI). At present, professionals working in language assessment and education have only limited diagnostic instruments to distinguish language impaired migrant children from those who will eventually catch up with their monolingual peers. 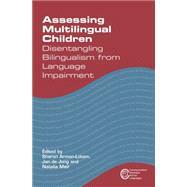 This book presents a comprehensive set of tools for assessing the linguistic abilities of bilingual children. It aims to disentangle effects of bilingualism from those of SLI, making use of both models of bilingualism and models of language impairment. The book's methods-oriented focus will make it an essential handbook for practitioners who look for measures which could be adapted to a variety of languages in diverse communities, as well as academic researchers. Sharon Armon-Lotem is Associate Professor in the Department of English Literature and Linguistics and a member of The Gonda Multidisciplinary Brain Research Center at Bar Ilan University, Israel.Jan de Jong is Assistant Professor at the University of Amsterdam, the Netherlands. He is a member of the Amsterdam Center for Language and Communication.Natalia Meir is currently working on her PhD in the Department of English Literature and Linguistics at Bar-Ilan University, Israel.